Dictators often change the electoral rules to advantage the ruling party. But not all changes benefit other members of the ruling coalition. Consequently, dictators must compensate potential losers within their own coalitions either indirectly through an electoral boost or directly with appointed positions. 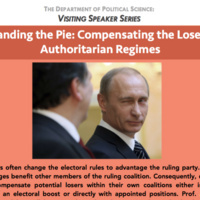 Prof. Jennifer Gandhi and her collaborators show that changes in electoral rules have been accompanied by these forms of compensation in the 2007 Russian Duma elections and in legislative elections for all autocracies during the post-World War II period.